That’s Hylda Baker of course. Well it is according to Keith Hutson who staggered onto the Arts Centre stage on the wrong end of a theatrical push. With a writing career encompassing Les Dawson skits and Coronation Street episodes and an enthusiasm as contagious as a double entendre titter, Keith read poems delighting in the days of Music Hall. ‘Tom Platt and his Talking Pond’ got an early mention, a mention that needs mentioning more often,’Tom Platt and his Talking Pond’ ponder that. When will we hear the like again? ‘A lot of their acts were bloody awful but that made them all the better’ says Keith, whose brilliant delve into the nether regions of a simpler, more complicated, life, earned its own wolf whistles and guffaws. There were tales of everything, from the tragic to the tremendous; Lottie Collins who literally danced herself to death, Ronnie, whistling, ‘in a state of grace’, to Marilyn Monroe. 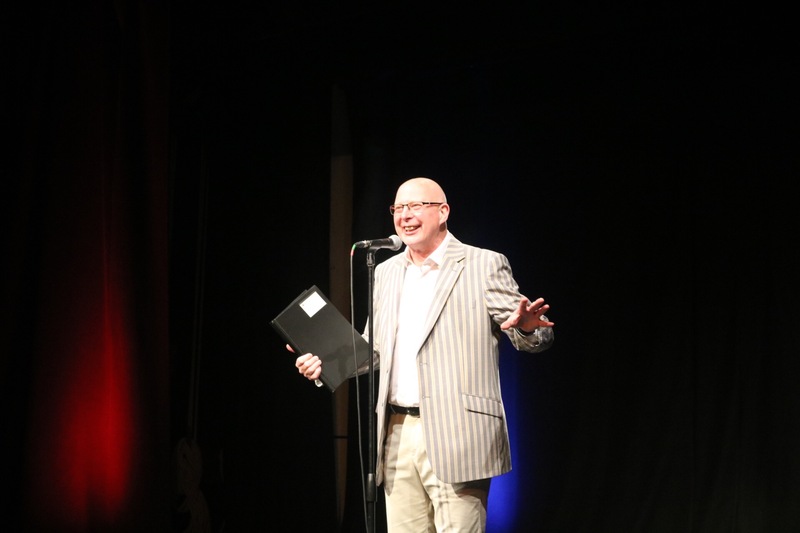 The tragi-comic nature of Keith Hutson material coupled with faultless delivery, showcased a brilliant sequence of poems which scored a direct hit on both heart-strings and funny bone. Keith Hutson’s Troopers took place at Swindon Arts Centre, 8 October 2016, part of Poetry Swindon Festival. His poems have just been released in the pamphlet, Routines, published by Poetry Salzburg. Chronicle written by Michael Scott. What if you threw a poem and no-one came? Sometimes no matter how great that you think an event is and is going to be, it doesn’t work. I am very used to my imagination colouring in the feverish excitement of eager punters in the build up to the event. Only to find that come the great day I am talking to someone who thought I was the Tuesday Yoga teacher. Or my audience is a drunk straight out of an all-day bender in the pub. Maggie Harris had already proved to be a warm and enthusiastic workshopguru at the Savernake Social Hall, what could make it just that little bit better? Nothing at all? No, tea and cakes of course.